The usage of e-scooters may differ from user to user. Some purchase it for their daily commute, while others use it for leisure and many other reasons. There is no doubt an e-scooter has become one of the most sought-after alternate means of transport. If you are still on the fence about whether you should be getting an e-scooter, perhaps the 11 reasons below will help you. Here are 11 reasons why e-scooter riders think you should be getting an e-scooter too! Before e-scooters there were bicycles, skateboards, and manual scooters to cover the first and last mile travel. But none can do it as effectively as an e-scooter. A press of the throttle and e-scooter riders can travel to their destination faster than the aforementioned devices, with some e-scooter having the ability to travel at a speed of up to 25 km/h. E-scooters are fast becoming one of the darlings for people that are looking to take control of their own travelling time. “Bus delay ah? Lucky I scoot”! Most e-scooters are foldable and portable. Even if there is a problem with the motor or chain or tire, the electric scooter can easily be carried back to the repair centre to get it fixed. Also, the ease of portability of the scooter makes it convenient for the commuters to carry around. E-scooters can be used on the pedestrian pathway; this immediately makes it a safer option than an e-bike. However, do take note of oncoming pedestrian when riding. *Take note – e-scooters are not allowed on the road. Click this to learn more: e-scooter faqs. E-scooter comes in different sizes and types, ranging from the lightweight e-scooters to ones with seats. You can easily find an e-scooter that suits your needs. E-scooters do not use petrol to power its motor; it does not generate greenhouse gases like devices that use petrol. By switching your car to an e-scooter, you are contributing to a greener environment all around. 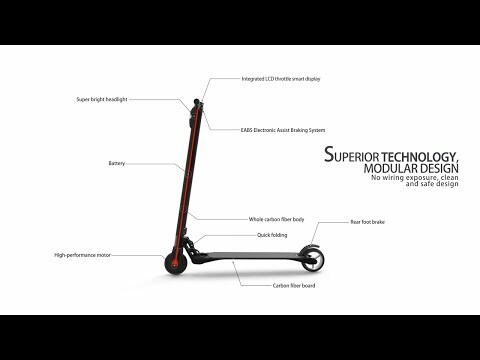 Most of the e-scooters in the market now have durable body frames. All you have to do is maintain the handlebars, the deck and, most importantly, the brakes. In some e-scooters, solid tires are used to minimise the chances of getting a flat tire. Basic maintenance like screw tightening and brake pad adjustment can be done easily from the comfort of your own home. Most e-scooters are compact in design which makes it highly portable. The carbon fibre variant such as the Mobot Starlite Pro weighs around 6kg and it can be folded easily to fit into tight spaces or a slightly larger bag. The compact design of these e-scooters give its owner more options than usual when it comes to parking or storage. Most e-scooters come with an assembly manual. In the manual, instructions will be given on how the user should fold and unfold the e-scooter accordingly along with the specifications of the e-scooter. The manual will also show how to attach certain parts that aren’t already, allowing it to be assembled by just about anyone within 10 minutes. The price of an e-scooter can range from $200 – $2000. As the price increases, so does the size, functions and specification of the e-scooter. The most expensive e-scooter is cheaper than a regular motorcycle in Singapore, which explains its popularity here. Not to mention, it is free from petrol and parking fees. Have you ever had a day where you feel like the convenience store is too far to walk yet too near to warrant catching a bus? The compactness of an e-scooter and its ability to travel long and short distance with ease means that it opens up a whole new category of leisure riding. Using an e-scooter, you will be able to go on an e-scooter road trip with your family and friends. An e-scooter can easily access places that were too inconvenient to get to by foot. In a busy city like Singapore, we are always fighting for more time. Using an e-scooter means cutting down on travelling time. The long walk towards the market can be cut short by a ride with the e-scooter. The time spent while waiting for a bus to the MRT station can be cut short by using an e-scooter to travel directly to the MRT station. Owning an e-scooter means owning a device that can help you save time and give you more leisure hours.